In addition to the established Animoji, and a few new characters like a tiger, koala, t-rex and ghost, Apple will begin offering something new in iOS 12: Memoji. As demonstrated during Apple's keynote at the World Wide Developer's Conference Monday by Apple's Kelsey Peterson, the new Memoji feature allows users to create an animated avatar of themselves. The Memoji creation tool allows users to customize the Memoji with their skin color, hairstyle, freckles, glasses and many other features with an intuitive interface that integrates cards, color pickers, sliders and more. In addition to Memoji, iOS 12 offers a new a Snapchat-style system of filters. 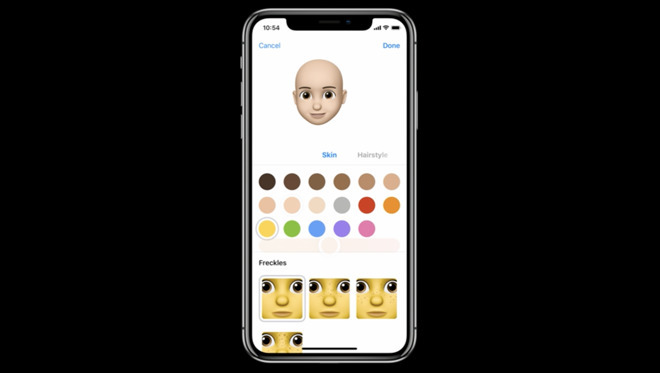 Users can even combine Anijomi and Memoji characters that overlay atop a user's head.